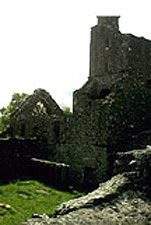 The last three photos of Creevelea are by curtesy of Gwen Brogdon from her trip to Ireland in 1999. 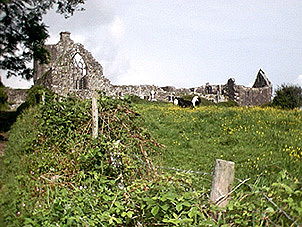 The Abbey of Creevelea, across from the town of Drumahaire on the bank of the Bonnett River in Co Leitrim is the family chapel of the O'Rourkes the kings of Drumahaire. 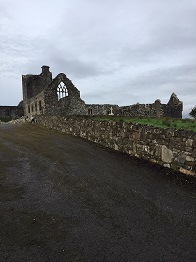 The Abbey is at N 54 13' 51.6", W 08 18' 37". The McTiernan ancestral grave is one of four at the foot of the high altar. It was first used for Hugh McTernan I, 1708--1783. Hugh O'Rourke and Catherine McTernan were buried in the grave next to Hugh McTernan I's grave on 8-22-1721. On their gravestone, the oldest gravestone in the Abbey, are a heart, club, diamond and club along with a figure of a cat. 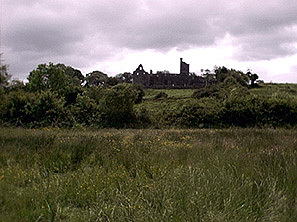 The Abbey of Creevelea is today one of Ireland's National Historic Sites.